Seeing how well my post on How To Make Your WordPress Blog Load Faster went over, I decided that I should post a follow up. The nice thing about this follow up is that it can be applied to all blogs and not just those powered by WordPress. With very few exceptions, all blogs are hosted on a server with limited resources (CPU, memory, storage, etc.). If those resources get tapped out, the blog will slow down and perform poorly. If the resources get overloaded, then the blog won’t load at all. In order to increase performance and handle more traffic, most bloggers will try to increase the resources available by upgrading to a bigger server or hosting plan. Before you do that however, try these tips to make your blog load faster by offloading server resources to other services. Handling email can take up a lot of server resources. If you are like me and use your domain for your email address (yourname@yourname.com), then you should consider offloading that Google Apps. By letting Google take care of your email, you’ll free up your server to do the more important stuff, like serving web pages. It’s not the sending and receiving of an email that takes up a lot of resource (unless you’re sending out a ton of emails, in which case, you’ll want to do the next step) it’s the dealing with all the spam. I send only about a dozen emails a day but I get thousands of spam every day and the server has to deal with them. By offloading my domain emails to Google Apps, I give that problem to Google and save resources on my server. Best of all, Google Apps is free! They do have a paid plan but most bloggers will never need it. I used to send out my newsletters using my own server and newsletter software. Now, I just use Aweber. Not only does this save server resources but a lot more of my emails got to their recipients because of Aweber’s uncanny ability to break through the spam filters. Aweber offers a $1 trial account for all new customers. The account is just like a normal Aweber account and includes unlimited email campaigns, newsletter, broadcasts and follow ups. It’s a great way to test drive Aweber to see what it can do for your blog. I used to store all my images on the server. Now, I store them on Flickr and hotlink to them. Not only does this save server resources but you also save a ton of storage space as well. Using Flickr is extremely economical. You are allowed to upload up to 200 images for free. Go above that and you’ll have to upgrade to a Pro account which cost $24.95 a year ($47.99 for two years). The Pro account allows you to upload an unlimited number of images. There’s an easy way and a hard way to use Flickr on your blog. The hard way is to go to your Flickr account to get the URL for the image you want to embed and enter it into your blog post. Th easy way is by using the he Flickr Photo Album for WordPress plugin. The plugin allows you to pull in your Flickr photosets and display them as albums on your WordPress site. There is a pretty simple template provided, but you can customize the templates to match the look and feel of your own blog (See my photo album). Flickr Photo Album for WordPress will also add a new Flickr icon to your WordPress edit screen. Clicking the icon will bring up your Flickr photo stream which allows you to easily insert your Flickr photos into your blog posts with just a couple clicks. You can either have your inserted photos link back to your WordPress Flickr photo album or directly to your Flickr.com photo page. 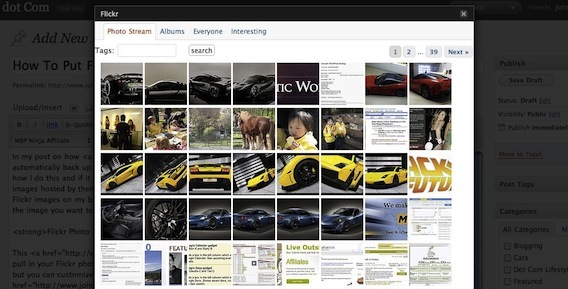 Flickr Photo Album for WordPress is pretty easy to install and use. However, making a custom photo album may require the help of your web designer. Most bloggers either use the supplied template or just link to their photo albums on Flickr. From a branding stand point, it’s better to keep the album on your blog and create a new template that matches your blog’s look and feel. Change the domain to your blog and you’re set. The code will prevent the hotlinking of photos, musics, video or any other files you want to add. A Content Delivery Network (CDN) like MaxCDN is one of the best way to offload server resources. The only problem is it cost money. Mind you, the cost is pretty minimum. MaxCDN charges $39.95 for the first 1000GB of data transfer. My blog uses around 2GB per day of CDN traffic. That works out to less than 80 cents a day. However, there will always be some people who’ll want a free option. 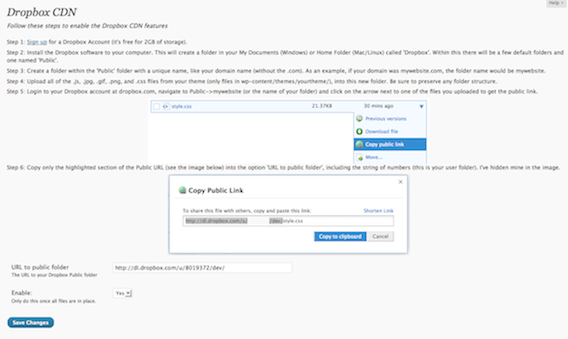 Dropbox CDN is a WordPress plugin that turns Dropbox in to a content delivery network. It’s a not a true CDN since Dropbox doesn’t replicate your files across the world like MaxCDN would but it is a good way to offload the serving of static elements to another service. A Dropbox account is free if you store less than 2GB of data (you get 2.25GB if you sign up via my link). If you’re an affiliate marketer, then no doubt you cloak all your affiliate links through some kind of URL redirect. One of the best redirect tools is the Ninja Affiliate plugin by MaxBlogPress. Ninja is a great tool but because it sits on your server, it can take up a lot resources if you’re using it to serve a ton of redirects. To try LinkTrackr, simply go and create your account. Use the coupon code JOHNCHOW to get 20% off any paid LinkTrackr plans, but there’s also a free option so you can test drive LinkTrackr for one full year.